Abusing admin powers is fun. lol That's not on this forum. Haseo wrote: lol That's not on this forum. Obviously someone out there hates loves FH. Very. I remember when you and the other admins had alchohol related usernames. That's child's play. Unfortunately I've done worse in the past. If anyone has a campfire we can have a good sing-along about the tale. Shall I get something to roast over the fire? Anything but an old boot. Bring it on home, DA! Heartless_Vice wrote: Anything but an old boot. Come along children for there is a story to tell. About an Admin, members and an IRC. A long time ago (year ago) there lived a dark place known as the IIRC, a place where members were free of mods (mostly) nothing left the IRC into KHV, but one day that all changed, and the face of KHV was changed forever. A plan was planned, a plan above all plans, a plan to see how people would react to a a stupid rule. There as the perfect candidate, a member who was very popular among the members, it was give that the member would not get any stick for it and that it would all back fire on the admin. The plan was to create a rule stating that if anyone insulted the member they would be banned. Of course members were outraged, accusing the staff of favouritism, several members were in on the job and sacrificed themselves to prove it was serious by banning them. Though the backlash didn't go to me by my surprise. But rather the popular member. Friendships ended and faith in people was distorted. Even after the truth came out the member still got the backslash from the forum. Yeah so a member got hurt who didn't deserve it, and a small prank turned into a big deal. The usual KHV thing these days. I guess you could say that it was one of the first true KHV drama's. 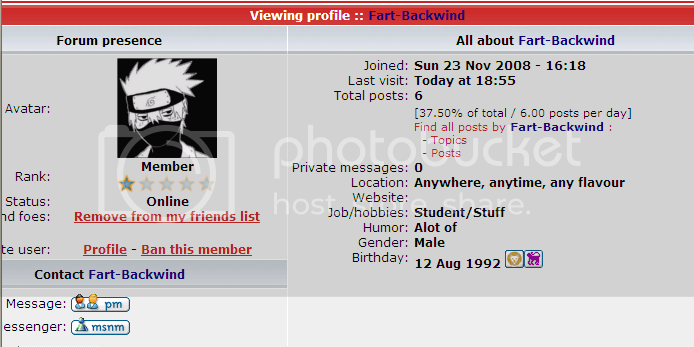 (Excluding what happened back in the first year of the site) Not a high point in my time as an admin. Seriously, it is an interesting idea. Wow, DA! You are or were an admin?